Polls have closed across Georgia in key local elections that are seen as the first test of the strength of President Mikheil Saakashvili's government since the disastrous August 2008 war with Russia. Georgians cast ballots to elect 64 new municipal councils for four-year terms. The most crucial test, however, is in the capital, Tbilisi, which, in addition to choosing a city council, is also directly electing its mayor for the first time. That race, observers say, will largely set the political landscape for parliamentary elections in 2012 and a presidential poll in 2013, when Saakashvili's second and final term as president expires. Two exit polls show incumbent Tbilisi Mayor Gigi Ugulava, a member of Saakashvili's ruling United National Movement and a close ally of the president, with a commanding lead. One poll, conducted by Edison Research for Rustavi 2 and Imedi TV, gives Ugulava 61 percent, with Irakli Alasania, leader of the opposition Alliance For Georgia, coming in a distant second with 17 percent. Another exit poll conducted by GfK and commissioned by the Georgian Public Broadcaster gave Ugulava 60 percent and Alasania 18 percent. Both Ugulava and Alasania are widely believed to harbor presidential ambitions. Final results are expected after midnight local time. Giga Bokeria, Georgia's deputy foreign minister and a member of a newly formed task force for free and fair elections, says that in contrast to previous polls, this round of elections has focused largely on bread-and-butter issues of local governance and has been surprisingly free of political grandstanding. "I would say that these elections are the first in my short memory where a critical mass, an overwhelming majority, of political parties -- not just the ruling party but the opposition parties, as well -- have run an issues-based campaign," Bokeria told RFE/RL on the eve of the vote. "We didn't have that before. That was one of the problems of the political culture in Georgia. So I think that is one very important step forward." Turnout appeared to be brisk in Tbilisi, with long lines forming at polling stations throughout the morning. By 5 p.m. local time, three hours before polls closed, the Electoral Commission said turnout had reached approximately 40 percent, both in the capital and nationwide. Nine candidates are vying to be Tbilisi's mayor, which is considered one of the most important offices in the country because one-third of Georgia's 4.5 million citizens reside in the capital. Speaking briefly to reporters after voting in the morning, Ugulava called the elections “historic” and praised his opponents for what he called a hard-fought but “businesslike” campaign. "I am sure there will be high turnout because it is the first time the residents of Tbilisi will elect a mayor," Ugulava said. "I want to thank all the candidates because it has been a really interesting campaign. All the candidates tried to express their views on how to improve the city. "I hope and believe that the election will be transparent and fair. It will be one more step toward democracy. We need democracy to foster greater stability." Ugulava, who analysts consider the leading presidential contender for 2013, has been aided by Saakashvili's strong public support and by a wave of frantic construction and urban renewal projects in the capital, which the opposition considers an unfair political use of his "administrative resources" as mayor. Alasania, Georgia's former ambassador to the United Nations, who leads a newly formed opposition coalition called The Alliance For Georgia, cautioned against trusting the exit polls in remarks to reporters. “Exit polls do not give a real picture. Only the actual vote tabulation will give us a real picture. We will make an assessment only afterwards,” Alasania said. Alasania smiled broadly and gave his trademark thumbs-up to reporters after casting his ballot. "I feel great," he said. "The weather is beautiful and I am sure turnout will be high. I am certain the elections will proceed normally. I voted for change." The soft-spoken Alasania, who won plaudits in Western capitals for his calming presence during the war with Russia, quit his UN post in December 2008 over opposition to Saakashvili's policies. Since then he has sought to establish himself as a mainstream alternative to both Saakashvili and Georgia’s noisy and often rambunctious opposition. He is widely expected to run for president in 2013. Prior to the vote, public opinion polls showed a clear advantage for Ugulava in Tbilisi and for the ruling United National Movement across the country. Speaking to RFE/RL on the eve of the vote, Alasania called the election "a test for democracy in Georgia." Alasania said he was not concerned by his weak showing in public opinion polls. He added that there were "a lot of silent voters" -- particularly young first-time voters -- who would come to the polls to support him. "I'm confident and I am very optimistic. Throughout all the meetings I had [with voters] over the past month and a half, I feel that we defeated the pessimism that was in society ahead of these elections," he said. "More people now are saying they will come out to vote and participate. More people understand how important these elections are to begin changes here on the local level and then on the central level." Speaking to reporters after voting in the afternoon, Saakashvili called the elections "the best since independence" and confidently predicted victory for the United National Movement. "Georgia is back on the European track. Georgia is back on the economic development track," he said. "We have performed almost miracles in this area. We have the freest electoral system and democracy in this part of the world, and we are very proud." The vote was closely watched, with hundreds of international observers from the European Union and the Organization for Security and Cooperation in Europe (OSCE) monitoring the polls. 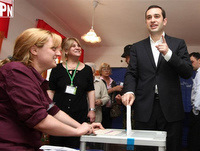 The Election Media Center, a monitoring group set up by three local watchdogs – Transparency International, the Georgian Young Lawyers Association, and the International Society for Fair Elections – released a statement ahead of the poll saying that there were "fewer violations" in terms of voter intimidation in the run-up to the vote than in previous elections. The report said the Georgian authorities were striving to “gain a positive assessment from the international community” but noted that reports of voter and candidate intimidation were more frequent in the regions than in Tbilisi. Opposition candidates in the Tbilisi mayoral race have complained that the threshold for winning the election outright in the first round -- avoiding a runoff -- was set by authorities at just 30 percent – a move they say clearly favors the incumbent. The ruling United National Movement and the Christian Democrats, a self-styled opposition party that often supports the government, announced on May 29 that they had hired buses to bring their supporters to polling stations. A similar practice during parliamentary and presidential elections in 2008 led to allegations of so-called “merry-go-round voting,” in which voters were ferried to cast several ballots at various polling stations. Representatives of the ruling party deny the allegation and insist that the process will be transparent.